The ultimate Nuviante combo especially designed to promote thicker and longer hair and nails is now available on-line for women worldwide. To effectively fight hair-loss and breakage, the new Nuviante complete solution kit uses gentle, natural ingredients in 3 synergistic beauty products that regenerate hair follicles, while supporting a healthy scalp. While nourishing the hair follicles from inside out, Nuviante boosts thickness, volume and shine, for a healthy and beautiful hair that shines and a more confident you! Suitable for the most sensitive of skin and every hair-type, Nuviante gets you perfect results, without unpleasant side-effects such as an irritated scalp or a brittle aspect of the hair. By providing the hair with essential fats and proteins necessary for the optimal fueling of all hair constituents, Nuviante Luxury Kit empowers the hair to be strong and radiant in no time. With powerful ingredients, such as biotin, bamboo silica, PABA, thiamine, riboflavin, inositol, MSM, horsetail, pantothenic acid, kelp and honey extracts, Nuviante System promotes hair growth acceleration, protects against the damaging effects of UV rays and maintains optimal levels of cellular integrity. 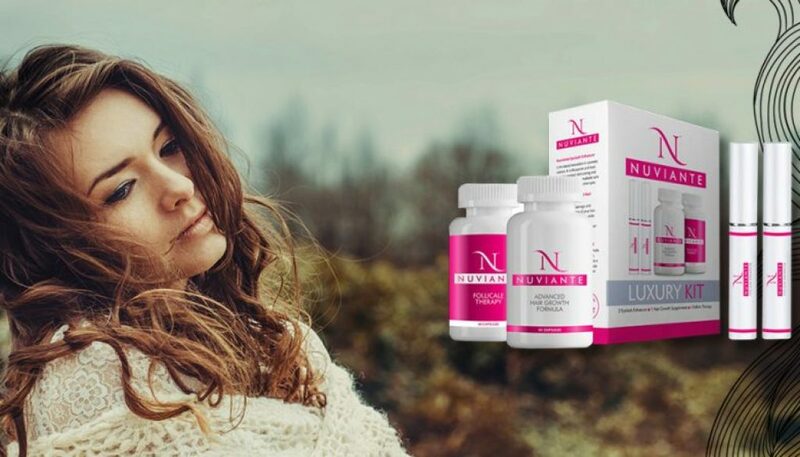 Summing up, if aiming to have a longer and stronger hair,order now the all-natural Nuviante System and effectively prevent hair loss, hair graying and hair damage, for a younger look that turns heads.